A French-styled oasis of wine and food in one of Honolulu's most interesting downtown neighborhoods. Entertainment: Entertainment Wed. & Sat. 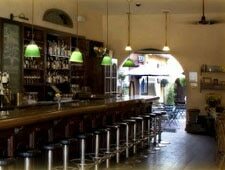 : The light in this wine bar-brasserie is a bit dimmer, the air cooler and each step on the distressed wooden floor carries you away from the bustle of Honolulu and into a vision of French charm. There are three distinct areas including an open-air courtyard which is particularly pleasant in the evening. Du Vin is a place to gather with friends and sip wine while nibbling on artisan cheeses and deli meats. For those craving more substantial fare there are daily specials plus a limited menu offering carefully prepared items; the moules frites is so popular it has remained on the menu since the establishment opened. The promising wine list features around 100 wines with more being added on a regular basis---all of them available by the glass.